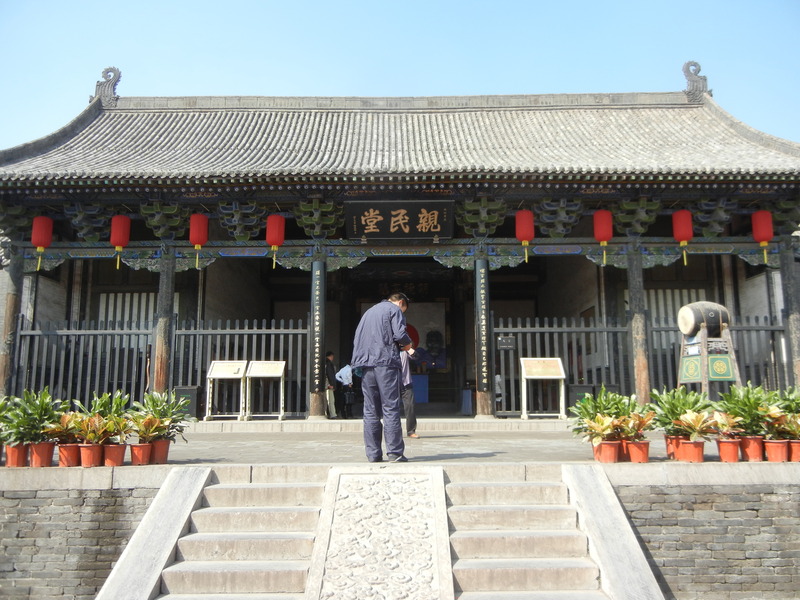 You can see a lot of intellectual depth in traditional Chinese architecture. It’s one of the world’s most prevalent art forms, so it’s easy to think you’re familiar with it. 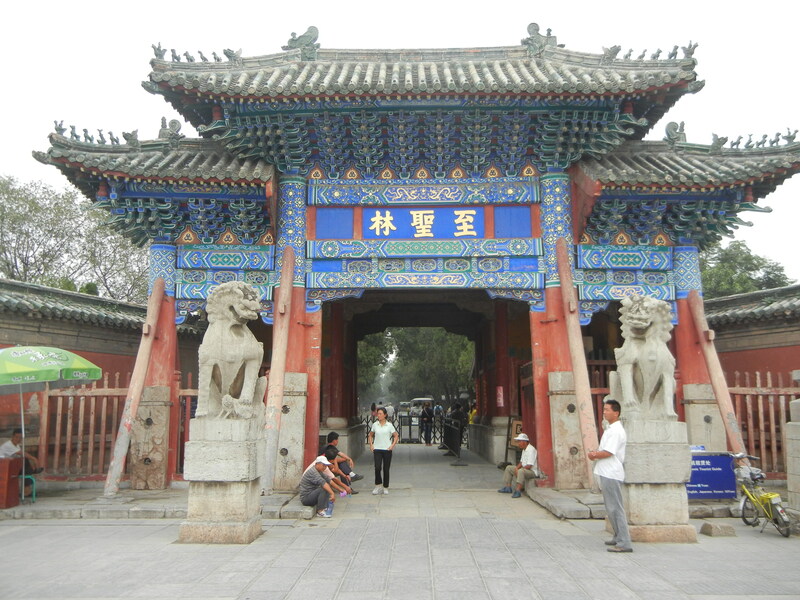 But Chinese architecture reflects the cultural wealth of the land it emerged in. So, we’ll explore some of the meanings under its surface. 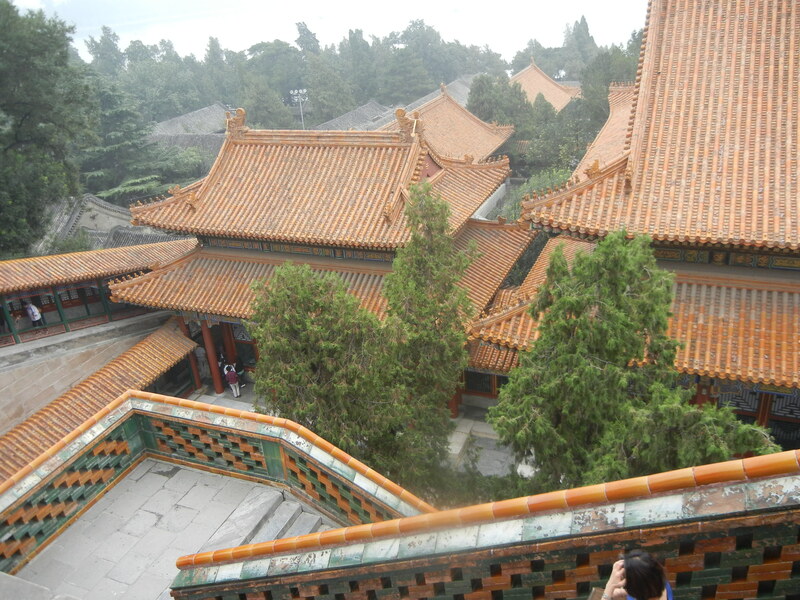 The roof is one of Chinese architecture’s greatest glories. The roofs in both of the above photos show what Liang Ssu-Ch’eng, in Chinese Architecture, called the immediately outstanding feature of Chinese architecture: a curved roof with overhanging eaves, which a wooden skeleton supports. 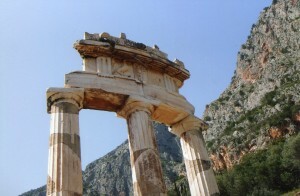 This is strikingly different from most Western roofing systems–they put a lot of stress on the outer walls. But the Chinese roof sits on the timber frame, and this distributes the stress evenly–there’s no need to pre-plan a system of inner walls to support the roof. 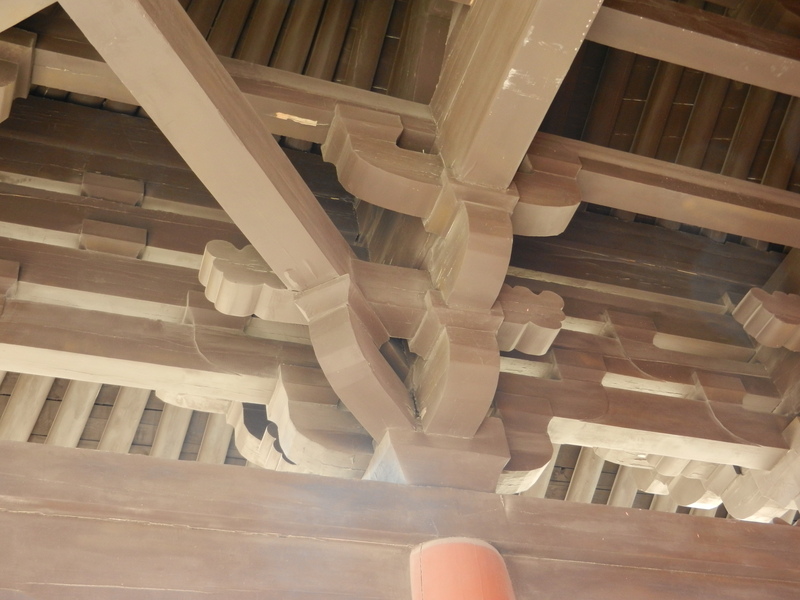 In all three of the above pictures, you can see many systems of wooden arms under the roof which bend at 90 degree angles on 4 sides. In each system, several arms (kung) stick out from a bottom cube, and bend upwards to support another cube, called a tou. One or more kung project from this tou and bend upwards to support another tou. 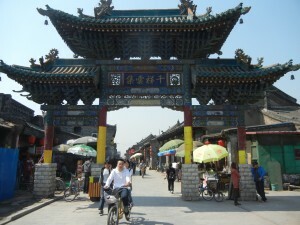 The whole contraption is called tou-kung, and it’s one of Chinese architecture’s most basic features. Western roofs often use capitals to receive the roof’s weight, and transfer it to a column. 1. 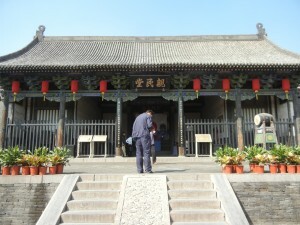 The tou-kung system is very flexible–it balances the forces throughout the roof, and this allowed Chinese architecture to develop as a tradition throughout East Asia. It’s flexible enough to be adapted to many materials and terrains. 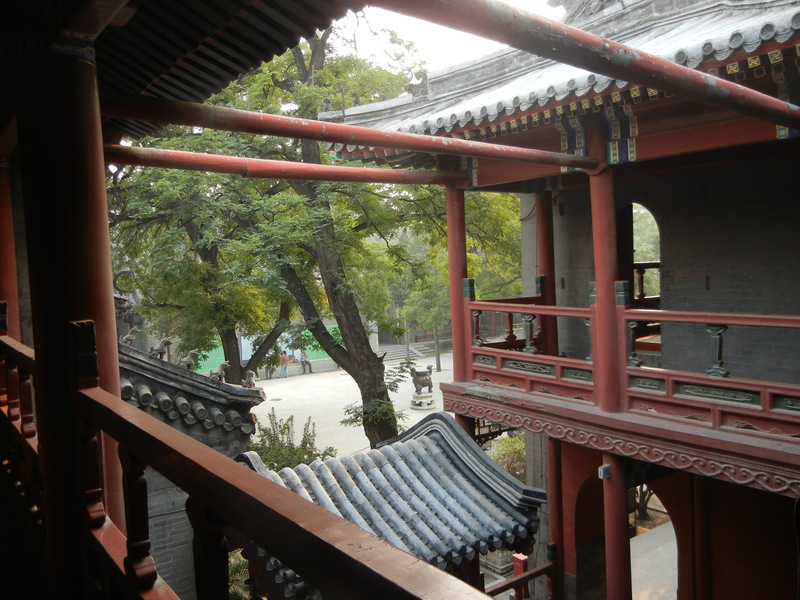 Like Chinese gardens, the roofing system helped spread Chinese culture, and allow people to feel that they share a common civilization. 2. The even distribution of weight reflects ideas of the harmonious flow of energies. 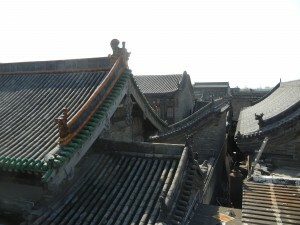 Chinese roofs don’t confront the walls and columns they sit on like Western roofs do–they balance all the forces in the environment, like yin/yang energies and wind. They also harmonize with each other. In the above picture, no 2 roofs confront each other. They all sit at different levels, and seem to flow together. 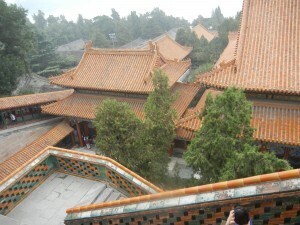 I find this to be the most beautiful aspect of Chinese roofs. Roofs harmonize with each other and the environment. No blunt surfaces hit each other. All surfaces mesh into a harmonized whole. 3. This focus on the whole, rather than any particular part, is reflected in traditional Chinese religions, which try to maintain harmony with many spirits. The roof also expresses this focus on harmony by curving and rising upwards at the corners–it honors Heaven and presides over Earth, and thus balances both. 4. This focus on the whole reflects domestic architecture–harmony within the entire compound and with its environment is the most basic concern. 5. 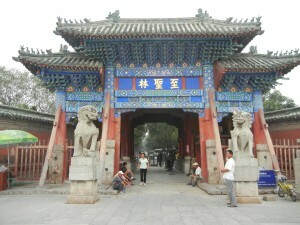 The harmony of the whole is also the central focus of both Confucianism and Daoism. All these ideas have reinforced the assumption that the well-ordered whole is more basic than the distinct entity since ancient times. Roofs, like many other things in China, reflect an infinitely rich cultural landscape.